Do you guys feel spammed by us yet? You're probably thinking "It's about time!" and yes we agree. We're going to try a new system of blogging out and we hope it'd work, do be patient yeah? Well that's really a question of opinion. You will get some people who die by using brushes, especially those from reputable brands like Sigma, MAC, Bobbi Brown and Real Techniques. Then there are those who swear upon their lives on sponges such as The Beauty Blender and Shu Uemura's new Lightblub sponge. On the other hand of the spectrum, there are people who believe that simple is best, and stay with just using their hands. There is no right or wrong here; I believe everyone is entitled to their own opinion. Brushes have their pros and cons, as you will read about further on. What Types are the Best? There is a continuing debate over Synthetic-Haired brushes versus Natural-Haired ones. It is difficult to say which is BETTER than the other because that is also a matter of opinion, but they each are excellent at providing different types of outcomes with different types of makeup. 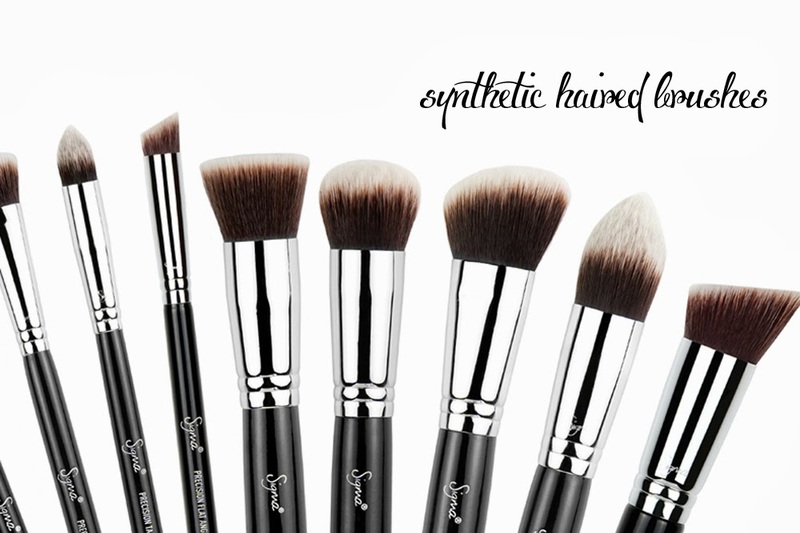 Synthetic brushes normally mean they are man-made (commonly from nylon or polyester filaments) and feel/look more plastic. They are normally colored/dyed so they do not look so plain. I'm sure you've seen those with gradients, right? Yeah those are some of them. Synthetic-hair is often use with liquid makeup such as cream/liquid foundations, gel eye liners, cream blushes, etc, and are better at creating soft layered looks. 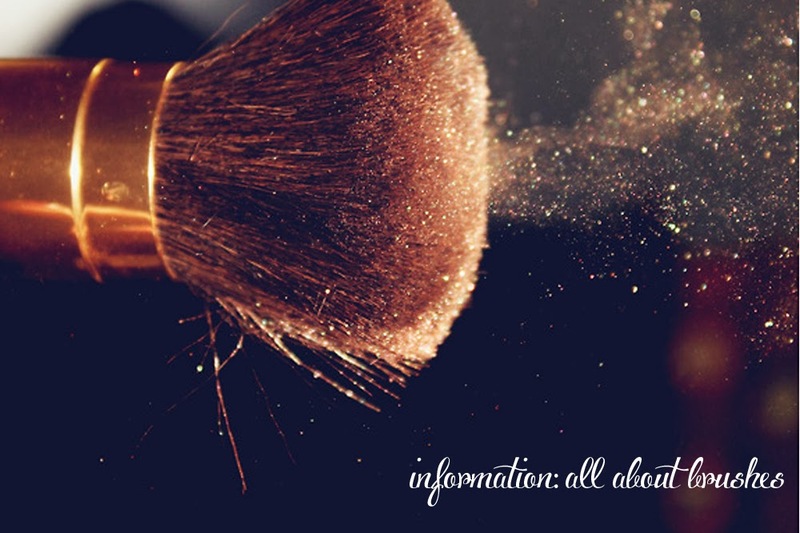 This is because they do not absorb the makeup pigment (at least not as much as Natural-Haired brushes do), so they can spread the product better with an even coverage. They are also easier to wash and keep clean, which means you can keep them for a longer period of time. Some people purely opt for these type of brushes because they are allergic to animal hair or because they are vegans. 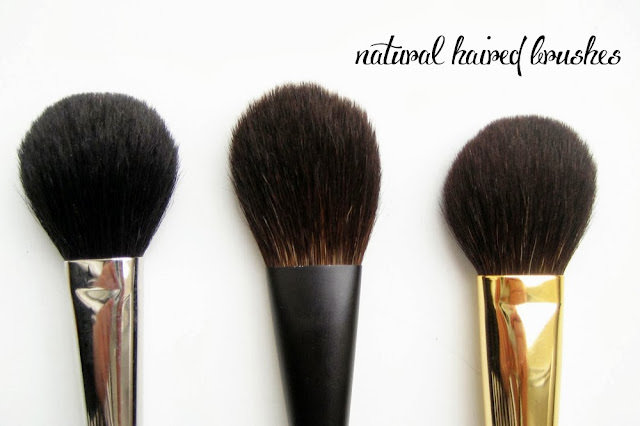 Yes, as implied from earlier, Natural-Haired Brushes come from animals. There is a huge variety available, the most popular being Squirrel, Goat and Horse hair. 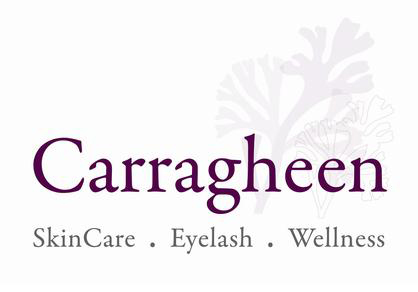 Their coarser structure is optimal for picking up powder makeup. This is because (and this may sound bad but it isn't), Natural Hair/ Animal Hair is much like Human hair, which means it isn't as smooth as Synthetics. There are "edges/ridges" to it, if you will, but that just allows it to pick up power products such as blushes and loose powders better! They also do not tend to "clump" together, but fan out when you brush it onto your skin so that the color is sheerer. Good brushes, to many, translates to expensive-as-hell. Well this doesn't have to always be the case. Yes, sometimes, paying more for quality really matters; but at the end of the day, nothing will really be sure until you test the brush out. The bristles are firmly held into the handle. 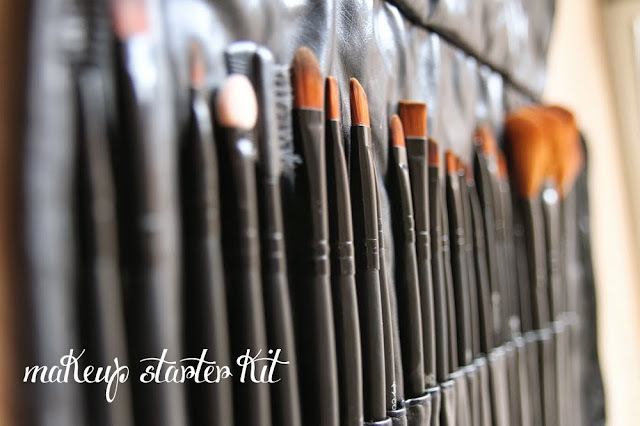 Cheap brushes normally drop or lose a lot of hair because they're glued to the base and washing loosens the glue. Good brushes have bristles which are not only glued but also folded and pinched into the case. Sure, a few hairs are bound to drop, but it is generally intact. How it feels in your hand. 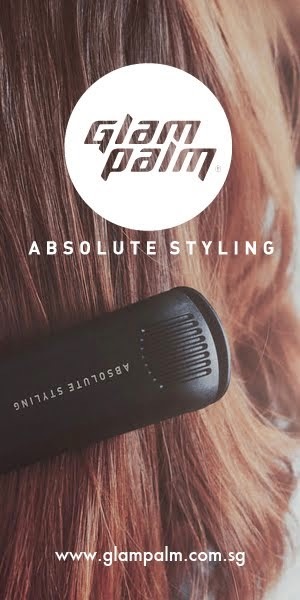 Do you like a firm steady grip or you prefer a light-weight brush? It all depends on how you feel and control it. Sometimes, you may even want something foldable/portable to bring out for occasions. Soft bristles. Now, some bristles are meant to be a little coarser for better application but just make sure they don't make you feel like you're scratching your skin out. Soft brushes may not always be the way to go, but ensuring that they always feel GOOD against your skin is important. There are many ways you can maintain/clean your brushes but I'll talk about a simple method everyone can follow. You can fill a bowl with some warm water and pump in some baby shampoo. Try not to use adult shampoo because there are way more chemicals in them. Baby shampoo is in a sense "purer". Do not condition your brushes as well; because you may not clean them off so well and the conditioner could end up clogging your pores. Point your brushes into the bowl and swirl them around. Try your best not to get the metal tip into the water (where the brushes are bound) because the glue inside can loosen and the bristles could fall out. Rinse everything off with CLEAN warm water and then gently squeeze out the excess. Lay the brushes on a towel or thick paper napkin and leave them out to air dry. 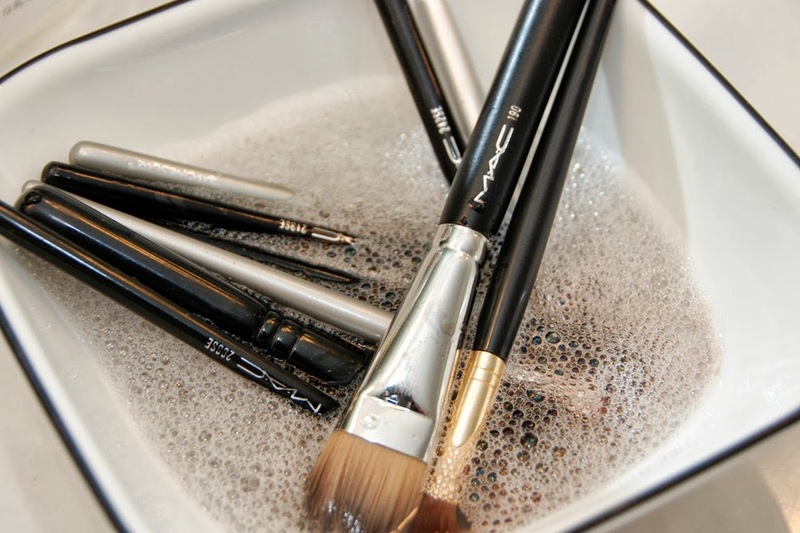 I normally wash my brushes in the morning after all my make up is done (about once or twice a week depending on how dirty they are) so they are able to dry the whole day and overnight as well. Okay, so now that that's out of the way, let's begin with the types of brushes you need. I normally suggest looking at the kind of makeup you use first before purchasing. Just because this or any other site might say "THIS IS WHAT YOU NEED", it isn't necessarily the case. I, for one, do not use eyeshadow, so I hardly find that a must in my kit. I suppose that seven is a good number, it covers almost everything you need. You can still mix-and-match if you wish. For example, as someone who doesn't use eye shadow, I might take out the two eye shadow brushes and replace it with a concealer brush. It's up to you. In my own arsenal, I own a Sigma F82 Round Kabuki Brush which is AMAZING at applying my blushes. It just buffs it right in and the color lasts so long. For my Guerlain Meteorites Illuminating Powder, I use the small kabuki brush that I received with my Smashbox Halo Powder set. Nothing great but it does the job. Now, it all depends if you're on a budget or not. If you'd like to go out and SPEND and make sure you get those of the finest quality, you can look at Hakuhodo brushes which can cost to more than SGD $120, with premium squirrel hair to boot. I would suggest that those looking to get really good Natural-Haired brushes to look at this brand. For Synthetic-Haired brushes, you can splurge on MAC, which is renowned to have some of THE BEST brushes you can dream of. If you're on a tighter budget, try out Real Techniques and Sigma, which you can get from Shopping-District and Luxola respectively! They're within a SGD $15-50 range, which I find more than okay! Do some research on your own, or even check out departmental stores and ask them to test some of their brushes on your hand first to try how firm/soft the brushes are. I hope this post has helped many of you, especially those who have been very unsure what to do with their brushes or what to buy! :) Leave your comments and questions and we will attend to them! I think MAC brushes are a LITTLE overrated. They're good yes but I think you could get brushes just as good from Real Techniques. They're only SGD $38 for a starter kit, which I find very reasonable. Not too long ago I swore by my fingers.... and then I found Koyudo & Hakuhodo.... and overnight my brush collection exploded! Now, I can't seem to have enough! LOL!